MTSU POLL: Democrat Bredesen l..
An MTSU business education professor has received one of the highest national honors her discipline can bestow. Textbook publisher McGraw-Hill Education presented the John Robert Gregg Award to Dr. Virginia Hemby, a professor in the Jones College of Business’s Department of Marketing, at the National Business Education Association’s annual convention in Baltimore March 30. Hemby, the author of four books, 10 book chapters and more than 30 articles in peer-reviewed academic journals, has been a specialist in business education for more than 25 years. Her areas of expertise are in business and workplace education; talent development; and meeting, event, exhibition and convention management. Her current research topics include bullying in higher education and age discrimination relating to graduation dates and veterans’ service in online employment applications. “I believe in business education as a discipline, not a career and technical education area only, but a discipline that prepares students for college and for life,” Hemby said. 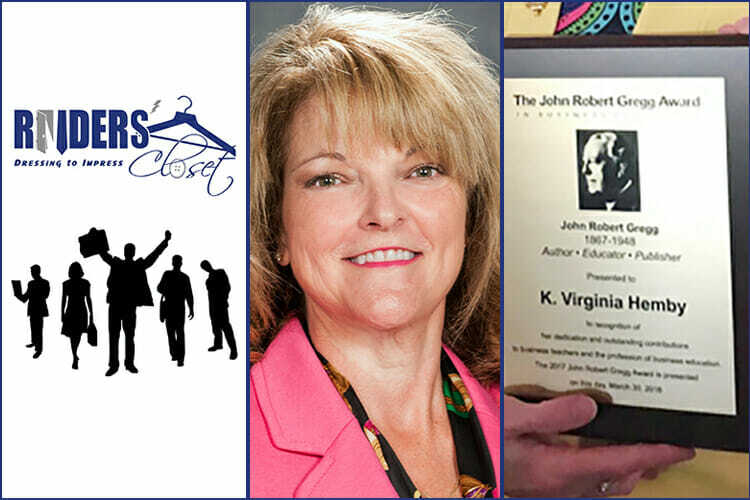 The NBEA hailed Hemby for her creation and oversight of Raiders’ Closet, a nonprofit organization that provides free professional attire for MTSU students seeking post-graduation employment. The closet also provides appropriate attire to students in local high school business groups to ensure a professional appearance in competitive events. Hemby has served as national president of the Association for Research in Business Education, co-chair of the international conference of the Association for Business Communication and member of the Policies Commission for Business and Economic Education for two terms. She also is a member of the advisory council of the state of Tennessee’s Division of College, Career and Technical Education, Hospitality and Tourism. Hemby earned her bachelor’s, master’s and doctoral degrees from the University of Southern Mississippi. She also is certified as an online instructor and a hospitality educator. The John Robert Gregg Award is named for the inventor of the system of shorthand writing that has been taught in schools and used by secretaries, court reporters, journalists and other professionals since its creation in 1888. It is “the most prestigious award in business education for over 60 years,” according to McGraw-Hill. Hemby, who’s taught at MTSU since 2004, also received one of the university’s highest faculty honors in 2017: the MTSU Foundation’s Public Service Award for her work with Raiders’ Closet.